1915, May 03: Canadian Physician Major John McCrae wrote his poem ‘We Shall Not Sleep’ … later known as ‘In Flanders Fields’. It wasn’t published until 8 December 1915. 1915, Aug. 21: A “Poppy Day” was held at South Shields, England, in aid of the Ingham Infirmary and local Poor Children’s Association – it raised £191 0s 4½d. The Infirmary has been found to treat the odd First World War serviceman. 1915, Dec. 08: The poem called ‘In Flanders Fields’, by John McCrae, was published in this day’s edition of ‘Punch’ magazine. 1916, May 27: The St. Michael’s War Work Party, in South Shields (England), held a Poppy Day “IN AID OF THE BRITISH AND RUSSIAN PRISONERS OF WAR” for ‘The Prisoners of War Fund’. (Shields Daily Gazette, 08 May 1916). It was held “to send many welcome parcels to our men who are prisoners of war in Germany”. “Hundreds of people in Shields helped to make the poppies, and thousands bought them …” (Shields Daily Gazette, 6 September 1916. 1916, Aug. 5: A ““Poppy” Day street collection” was held in Shipley, West Yorkshire in England, for the benefit of the Shipley Soldiers’ and Sailors’ Comforts Fund – it raised £38 12s. 4d. 1916, Aug. 19: The Sleights Red Cross Hospital, on the Yorkshire Moors (England), held a Poppy Day in Whitby – to raise additional funds for their Hospital’s war effort. “Ninety-two gross of poppies made by the Crippled Girls’ Guild, were purchased …” ahead of the event. The Crippled Girls’ Guild was well-known for making beautiful artificial flowers – which included the roses for the Queen Alexandra Rose Days. 1917, May: Australian Driver Rupert George Cooke (of the Motor Transport Company, Australian Imperial Force) picked a fresh poppy at Pozieres, “on the Somme” … and sent it home to his family. It will never be known just how many soldiers did that. 1918, Apr. 05: A Poppy Drive was held in Wall Street, New York this afternoon. Women sold artificial poppies to “plethoric” brokers – the drive made $2,000 to help finance American women doctors going to France. The earliest Poppy Sale, or Distribution, discovered. 1918, Jun. 06: New York’s ‘Evening World’ edition of that day reported that American soldiers “decorated their steel helmets with poppies from the fields”, before going into battle at Veuilly-la-Poterie, France. 1918, Sept. 04 & 05: Nebraska State Fair held this day:- “The Red Cross, Food For France organisation, YM. & Y.W.C.A. War Fund and National League for Service are gathered together fraternally just outside the textile building where the government exhibit is located. Madame Guérin, with her sister, Mademoiselle Boulle, and four local ladies “sold buttons at ten cents apiece before the food fund tent.” Anna and sister Juliette Boulle were staying in Lincoln, Nebraska, with Miss Anna May Pershing – the sister of the famous US Army General John Joseph Pershing. The word “buttons” is quoted but no description of them has come to light. It is not certain whether these were “buttons bearing the American and French flags” (19 July 1918, Omaha) or whether Anna and Juliette distributed, floral boutonnières. Certainly, soon after, newspaper reports refer to Anna selling “boutonnières” at her ‘Poppy Drives’. (?“buttons” = boutonnières – when Madame Guérin distributed boutonnières for cash, they were always poppies). 1918, Nov. 09: Not for the first time, Moїna Michael read John McCrae’s poem ‘We Shall Not Sleep’ (later known as ‘In Flanders Fields’) in the ‘Ladies Home Journal’ edition of this day. On this occasion, it appeared alongside a very emotively illustrated advertisement for Druggists ‘Bauer & Black’ – which depicted poppies “between the crosses, row on row” and soldiers ascending high above the horrors of the battlefield. She wrote a “reply” poem called ‘We Shall Keep The Faith’. Moїna had her epiphany moment – she would always wear a poppy in remembrance. This occurred whilst the ‘Overseas Y.M.C.A.’s 25th Conference was taking place at Columbia University, New York – where Moїna had been a volunteer since September 1918. Moїna was given a cash contribution by some of the men attending the Conference – for creating (at her own expense) a homely environment with flower arrangements. She had the idea to hand out poppies for the men to wear too. With no poppies at her workplace/in her arrangements, Moїna went out to the shops and purchased some with this unassociated donation. She gave them out to Conference men later that day. She considered she was the first person to make a sale of a memorial poppy. Was this a “sale”? 1918, Dec. 04: A letter dated thus was written to Moїna Michael, from “Y.M.C.A. Conference, Columbia University, N.Y.City” (signed “John G. Jury” “Pres. 28th Conference Y.M.C.A.”) informing: “… that the twenty-eighth Conference of the Overseas Y.M.C.A. Workers, at their sessions adopted the Poppy as the emblem of their organization. …”. Reference “1918, Nov. 09”, shown above. 1918, Dec. 13: Moїna Michael signed a contract with Lee Keedick (a publicity agent) and Otho L. Ferris (a Y.M.C.A. Secretary), enabling them to act on her behalf. In doing so, she assigned and transferred the “rights and interests” of her poem to the two gentlemen and contracted them to act on her behalf with regard to her Torch of Liberty and Flanders Poppy design – her ‘Victory Emblem’. 1918, Dec. 26: Moїna Michael applied for a patent for her ‘Victory Emblem’ badge design. This was Moїna Michael’s design of a “torch and poppy combined as a victory emblem to be worn and to be displayed on banners, stationery, cards, escutcheons, etc as a memorial to the dead and a tribute to the living who served in defence of world liberty.” (Moїna Michael’s Papers). 1918, Dec: ‘La Ligue des enfants de France et d’Amérique’ was created in Paris – affiliated to the French government. The poppy is the organisation’s emblem. Madame Guérin’s U.S. branch followed – called the ‘American and French Children’s League’ but sometimes referred to as ‘Fraternal League of the Children of France’ and the ‘Inter Allies Children League’. It was not linked to the ‘Fatherless Children of France’ charity – it was a charity for fatherless children in France. 1919, Feb. 06: The New York Tribune reported (under the heading “Calvary Church Adopts Flanders Victory Flag. First Organization to Accept Design Inspired by Colonel McRae’s Poem”) that Moїna Michael’s “flag of Flanders Field, with poppies entwined around the torch of Liberty, has been accepted by Calvary Baptist Church as its “Victory Flag”. 1919, Feb. 07: ‘The Atlanta Constitution’ published an article about Moina Michael headed: “Georgia Girl Is Originator of New Victory Emblem Idea” … Miss Michael conceived the idea of having the Flanders fields poppy and the torch of Liberty adopted as a symbol … it contained the colors of the allied flags”. 1919, Feb. 14: In a letter dated 24 December 1940, Lee Keedick (the “MANAGER OF THE WORLD’S MOST CELEBRATED LECTURERS”) replied to a letter from one Stella S. Center – giving answers to 3 questions posed in connection with Moїna Michael’s proposed book. He wrote “Answering your communication December 21, I may say that all my records pertaining to the poppy were destroyed by fire, and I can only answer your questions from memory.” “ … (3) Colonel Bishop lectured in Carnegie Hall, New York City, on February 14, 1919, under my direction, and as I recall, the Boy Scouts did sell the Memorial Poppy that night.” (Source: Moїna Michael’s papers held at the Hargrett Library, Georgia). This event was, of course, not the first poppy sale/distribution. Lee Keedick was also the Manager/Agent of Colonel William A. Bishop (Canadian flying ace: “The Ace of Aces”). Colonel Bishop gave several lectures at the Carnegie Hall in February (including the 14th) and reviews appeared in newspapers but none mentioned poppies and/or boy scouts. 1919, Feb. 15: Moїna Michael’s “Poppy and Torch Banner” flag hung above the stage of the Academy of Music in Brooklyn, New York, when the same Colonel Bishop gave another lecture. (19 February 1919 The Brooklyn Daily Eagle). 1919, Mar. 11: Moїna Michael’s badge design, the entwining torch and poppy ‘Victory Emblem’, was granted a US Patent. On this day (and other days), Moina Michael wrote a letter “to all parts of U.S.A.” promoting her Victory Emblem movement. 1919, May 30: This was the American Memorial Day. In France, the British Ambassador to France, the Earl of Derby, and his future son-in-law, Malcolm Bullock, attended a memorial ceremony held at an American cemetery in the Paris suburb of Suresnes. At the Earl of Derby’s family seat, Knowlsey Hall, there is held a scrap book belonging to this Earl of Derby and, within the 1919 pages, are pressed two artificial paper flower boutonnières. The boutonnières’ flowers represented poppy, cornflower (le Bleuet) and marguerite daisy (the ‘Marguerite de Paris’ or the ‘Paris daisy’). These three flowers have been seen described as the ‘Bouquet de France’ on postcards of that era. It is deduced that these boutonnières were worn at the American cemetery at Suresnes on this day. 1919, June 06: Milwaukee, Wisconsin staged an official celebratory homecoming for the 120th Field Artillery (including the US 32nd Division). Mrs. Mary Hanecy is mentioned sometimes in the Poppy story – she was, at the time, the President of the ‘Thirty-second Division Mothers’ and part of the reception committee for this homecoming. At this event, Mary is reported to have decorated a donut and coffee booth with poppies; it was stripped twice of the flowers as patriotic Americans took them; and money was left on the counter, in gratitude. This money was reportedly used for the benefit of disabled veterans. The author does not consider that this was a “sale” of poppies. It is reported that Mary Hanecy suggested to her American Legion branch that poppies be sold on the streets of Milwaukee on 19 May 1920 (ahead of Memorial Day, 30 May), to raise funds for US veterans. Thus, it appears, Mary was behind the Milwaukee American Legion Post 1 carrying out the first American Legion-organised ‘Poppy Day’, but it was not the first per se. 1919, Aug. 02: Madame Guérin held a ‘Tag Day’ (Poppy Day) in Duluth, Minnesota. 1919, Oct. 08: On this day, Madame Guérin addressed the first convention of the Gold Star Mothers of Baltimore and, after reading the poem ‘In Flanders Fields’ to the audience, she proposed the idea of poppies being the “symbol befitting the heroes of the war”. This proposal was accepted. Plans were made that she use the Flanders poppies as a means to raise 1,000,000 francs for the children of devastated France, and it was decided that in each state one of the Gold Star Mothers would be her state president of the Flanders fields poppy days. Immediately, she made a silk sample of the Flanders fields poppy and then had 10,000 silk poppies made in Baltimore and, two weeks after the convention, the first poppy day in the streets of Baltimore was held. 1919, Oct. 25: Madame Guérin’s Poppy Day in Baltimore, with Baltimore-made poppies. 1919, Nov 11: Madame Guérin had planned a second Poppy Tag Day in Baltimore, Maryland. Heavy rain meant it had to be cancelled. 1919, Nov 15: Madame Guérin held her second Poppy Tag Day in Baltimore, Maryland – with red, white and blue poppies. 1919, Dec 27: 27-29 Dec.+ Madame Guérin was in Sioux Falls, South Dakota. In an interview, she talked about her aim to hold a “Poppy Tag Day” everywhere in April 1920. 1920, Jan 02: Madame Guérin visited Rapid City, South Dakota, “early in the year” – perhaps it was around this date, given that she had just been in Sioux Falls. She spoke to the Chamber of Commerce about setting up a committee for her Children’s League and, subsequent, Poppy Day in August. 1920, Apr. 03: “The first big Poppy Day for the American and French Children’s League “was in Denver, the day before Easter” – on this Saturday, ‘twixt Good Friday and Easter Sunday. 1920, Apr 05: Mon. morning: Madame Guérin arrived in Salt Lake City, ahead of a ‘Poppy Day’ there on 10 April. She gave an interview, at the Hotel Utah, to the Salt Lake Telegram about her Poppy Drive in the city. Mrs. Leonel Ross O’Bryan had been there beforehand, making plans ahead of Madame’s arrival. 1920, Apr 06: Madame Guérin spoke:- to students of the University of Utah, at 11.30a.m., including? students of the Latter Day Saints University? ; and (in French) before Alliance Française members and a general audience – on the mezzanine floor of the Hotel Utah, Salt Lake City at 8 p.m.
1920, Apr 07: Poppy Drive committee meeting and the Utah committee of American and French Children’s League were formed. Madame Guérin spoke at West Side high school and Roland Hall academy about the French children. 1920, Apr 08: Madame Guérin spoke: at the East side high school, in the morning; at St. Mary’s academy, in the afternoon; at a general/public meeting at the Assembly Hall, Salt Lake City, in the evening. 1920, Apr 09: Madame Guérin spoke at the Bryant school. The University of Utah held a Poppy Drive on the campus – it made $126.24 for Madame Guérin’s Children’s League fund. The weather was so bad that it was only held in the morning. However, in that short time, the distribution of poppies raised $2,760! Another Poppy Day was arranged for the 17 April and was only held in the afternoon. There was due to be a ‘French Poppy Dance’ in the evening but it was postponed. 1920, Apr. 10: ‘Poppy Day’ in Greeley, Colorado. Greeley Daily Tribune: “Today Greeley has been turned into a poppy field. Every citizen wears a scarlet flower, on every street corner Greeley girls are selling poppies for the orphans of France. Under the direction of Mme Celeste Oliver Dixon and Mlle. Lucienne Le Fraper, who are representing the American and French Children’s League today was made poppy day in Greeley. Mrs. Howard Price, instructor in French and Latin at the Greeley high school has been on the street all day chaperoning the fair poppy sellers. The poppy sellers will be on the streets until 10 o’clock tonight. …” For the benefit of Madame Guérin’s American and French Children’s League. 1920, Apr 11: In the morning, Madame Guérin spoke at the Third Ward meeting house in Ogden, Utah, “on the condition of French orphaned children” – ahead of a Poppy Day there on 17 April. She was accompanied by Leonel O’Bryan (Polly Pry). In the afternoon, Madame Guérin and Leonel O’Bryan (“Polly Pry”) addressed “the regular afternoon meeting” at the Salt Lake City tabernacle. It is reported that Madame Guérin spoke at Ogden’s Third Ward meeting house in the evening too. 1920, Apr 15: Madame Guérin addressed an audience in the afternoon at the High School in Brigham City, Utah. It was decided to have a Poppy Day in the city on 24 April. 1920, Apr 15: Madame Guérin spoke at Ogden City Hall, at the meeting of the Weber county women’s Republican committee. Madame Guérin’s Utah representative, Mrs. Georgina Marriott, presided. 300 school girls would be poppy girls at a Poppy Day on 17th. 1920, Apr. 16: Ogden, Utah: Madame E. Guérin, representing the American and French Children’s League, spoke on the aims of the society and asked for the support of the women on Poppy Day, which is to be celebrated here tomorrow, when the population will be tagged in behalf of the work of the society. 1920, Apr. 17: A second ‘Poppy Day’ in Salt Lake City, Utah – but only from 2 p.m., to compensate for the curtailment of the ‘Poppy Day on the 10th. This included selling poppies at the Salt Lake-Seattle ball game. 1920, Apr. 17: Madame Guérin in Ogden, Utah: Poppy Day on this day. Then going off to Brigham City (Utah), Logan (Utah), Park City (Utah), Provo (Utah) & Preston (Idaho) – promoting poppy drives. 1920, Apr 18: Madame Guérin, together with Leonel O’Bryan (Polly Pry) and Jeanette A. Hyde (Utah State Chairman for the American and French Children’s League), addressed a meeting at the First Ward Chapel in Provo, Utah – in relation to a Poppy Day Drive there on Saturday, 24 April. Mrs. Hyde was in Provo on the 23 and 24 April, to assist with the Drive. Madame Guérin spoke at “several” theatres in Ogden in the evening. 1920, Apr. 22: Poppy Day in Preston, Idaho … after Anna and Georgina Marriott had initiated their “Poppy Day campaign” for “destitute children in France” in Preston. 1920, Apr 22: Madame Guérin spoke at the Park City high school – on the French orphans and ‘Poppy Day’. Her engagement took place “between trains”. 1920, Apr 22: Madame Guérin spoke at a special assembly at the high school, in the afternoon. It was decided to designate Saturday 24 April as ‘Poppy Day’ in Brigham City. 1920, Apr. 22: In Caldwell, Idaho, a total of one hundred fifty High School girls carried out a “tag day” “for the benefit of French children in the devastated sections of France” The day was officially designated as “Poppy Day.” Local lady Mrs. Amelia Anderson was in charge of the campaign in Caldwell. “Tags to be sold are in the form of a poppy”. Georgina Marriott had addressed an audience there on 15 May – and recruited the girls. She was the accredited representative of Madame E. Guérin, the “French director of the movement”. $2000 was raised. (Caldwell Tribune, Idaho May 18). 1920, Apr. 24: Utah: Poppy Day Drives began 24 April in Brigham City, Logan, Park City & Provo. Many other places held Poppy Days (Le Semeur). 1920, Apr 24: Madame Guérin, together with Leonel O’Bryan, was at the Capitol building in Salt Lake City in the evening. After three postponements, a ‘French Poppy Dance’ – also referred to as ‘The Tricolor Ball’ and ‘The Poppy Cyclone Ball’, was finally held there. Local American Legion members organised it but Anna Guérin and Leonel O’Bryan were in charge of the entertainment. 1920, May 8: Poppy Day in Price, Utah. Mrs. Georgina Marriott visited to organise the Day on behalf of Madame Guérin. 1920, May: Madame Guérin: “month’s trip through Idaho and Montana, where she conducted “Poppy Drives” for the relief of the children of the devastated section of France”. Also a Poppy Drive in Seattle …. (written 27 May, Hartley Burr Alexander papers) “Mrs. Buckmaster came again to help me in Seattle. We had $4700 not half enough girls …”. 1921, 20 May: It was announced in Bridgeport, Connecticut, that the local American Legion had taken receipt of poppies made by disabled veterans at Allingtown hospital, Allingtown, Conn. – for their own poppy sale, for their own benefit. 1920, May 22: Poppy Day in Caldwell, Idaho, a total of one hundred fifty High School girls carried out a “tag day” “for the benefit of French children in the devastated sections of France” The day was officially designated “Poppy Day.” Local lady Mrs. Amelia Anderson was in charge of the campaign in Caldwell. “Tags to be sold are in the form of a poppy”. Georgina Marriott had addressed audience there on 15 May – and recruited the girls. 1920, May 24: Milwaukee Poppy Week began: reference Mrs. Mary Hanecy (06 June 1919), the Milwaukee American Legion Sergt. Arthur Kroepfel Post No. 1 carried out the arrangements. 1920, May 29: Poppy Day in Omaha, Nebraska. 1920, May 31: Milwaukee Poppy Day: reference Mrs. Mary Hanecy (06 June 1919), the Milwaukee American Legion Post 1 carried out its first Poppy Day … it was not the “first” per se. However, it appears to be the first individual ‘Poppy Day’ organised and run by American Legion members in the USA. Apparently, the event was at the suggestion of Mary Hanecy – she was a member of the Milwaukee American Legion Post 1 Auxiliary and President of the 32nd Division Women’s Corp.
1920, May 31: Pocatello, Idaho. Madame Guérin was there. Memorial/Decoration Day … ?arranging a Poppy Drive. 1920, Jun 02: Portland, Oregon. Madame Guérin was there … ?arranging a Poppy Drive. 1920, Jun. 12: Poppy Tag Day in Kansas. Under direction of Mr. & Mrs. M.H. Gray of Denver, on behalf of the American and French Children’s League . Funds collected held back because the A&FCL was not on the National Information Bureau’s approved list. This was remedied in May 1921, when the League was granted a formal endorsement by The National Information Bureau – after a change of name and structure. 1920, Jun 12 : Poppy Day in Rexburg, Idaho …. Madame Guérin and Ogden’s Georgina Marriott are reported as organising it. The two women then travelled north, to Butte, Montana (190 miles north). Madame Guérin “conferred” with State Governor Stewart and received his “indorsement”, together with that of the State Superintendent of Instruction (Schools) and the Commander of the American Legion in Montana … these three, together with the Governor’s wife, Mrs. Stewart, became part of her American & French Children’s League committee for Montana. 1920, Jun 15: Madame Guérin arrived back in Butte, Montana. She gave a public lecture in the American Legion Club Rooms – on the devastated regions of France and her Poppy Days . 1920, Jun 16: Madame Guérin spoke to the American Legion members – she explained “the object of “Poppy Day” and asked for hearty co-operation from local American Legion men.” After the session, a reception took place for her. 1920, Jun 18: In the afternoon, Madame Guérin addressed the women of Anaconda ref her Poppy Days, at the Montana Hotel. Ogden’s Georgina Marriott was with her. 1920, Jun. 19: Poppy Day in Helena, Montana. 200 girl poppy sellers. Miss Genevieve H. Parke carried out arrangements made by Madame Guérin. Poppy Days were held all over the State of Montana. 1920, Jun. 21: Madame Guérin met with 15 women involved with Butte’s ‘Poppy Day’ at Gamer’s Tea Shop, in Butte, in the afternoon. After the tea, Madame Guérin met with 150 women and girls at the American Legion club rooms. Plans were laid out: “… transportation on all car lines of the city will be free to all women who are selling. These will be known by a scarlet and white badge, worn across the breast, bearing the quotation from Lieut. John McCrea’s famous poem, “In Flanders’ Field, the Poppies Grow.” … and … “the girls will wear chic red caps”. 1920, Jun 22: Poppy Day in Butte, Montana. Madame Guérin was there, with Ogden’s Georgina Marriott. Reportedly, the Day raised approximately $1,500. 1920, Jun. 23: Great Falls Daily Tribune, Montana. Miss G. H. Parke of American and French Children’s League gave a short talk explaining needs of fatherless children in devastated regions of France. The auxiliary members “expressed themselves willing to assist in whatever way they may with the poppy day which the league expects soon to put on through Montana. At this time, poppies, reminders of poppies of “Flanders Field” immortalized by Col. McCrae, will be sold on the streets. 1920, Jul. 04: “Mrs. Georgiana Marriott has returned from a two months’ trip through Idaho and Montana, where she conducted “Poppy Drives” for the relief of the children of the devastated sections of France. She was assisted by Madame Guérin, who is interested in relief work. Mrs. Marriott is state organizer for Idaho of the American and French children’s league.” Ogden Standard Examiner, Ogden, Utah. 1920, Jul 14: Poppy Day in Sacramento, California. On 08 July: Madame Guérin gave a speech to the Lions Club in Sacramento. Madame LeGrande-Girarde (wife of French WW1 General Émile Edmond Legrand-Girarde) accompanied her and she gave addresses to the Rotary Club and at a meeting of the Veterans of Foreign Wars in the courthouse. Plus several members of the New Jersey delegation (VFW?) were present and made short talks. Madame Guérin was in the city for at least eight days: 08 – 15 July. 1920, Jul 17: In Great Falls, Montana, a “conference” was held to make decisions about a Poppy Day there – as part of Madame Guérin’s Montana state-wide campaign. Butte’s Mrs. F. B. Smith was in charge. It was decided not to have a “Day” but to offer poppies for sale at the theatres during evenings. 1920, Jul 19: The ‘Poppy Evening’ Drive began in Great Falls, Montana. 1920, Jul 23: The last ‘Poppy Evening’ was held in Great Falls, Montana, at a Band Concert. The Drive had run for 5 (five) evenings. 1920, Jul 24: Poppy Drives at Huron and Mitchell in South Dakota. 1920, Jul. 26: Poppy Day in San Francisco. Madame Guérin was in the city on 19 July, to organise – she addressed “the women at the Fairmont meeting. Poppy Day badges and banners inscribed:- “In Flanders Fields the Poppies Grow”. Reportedly, $5000 was raised in San Francisco. 1920, Jul 29: Poppy Day in Berkeley, California. Madame Guérin and Miss Patsy A. Epperson had been in Berkeley to organise a committee for the American and French Children’s League. On 27 July they addressed a meeting of women, after which a committee was formed to make arrangements for Poppy Day’. Patsy Ann Epperson was a “delegate” from the League’s “middlewest committee”. 1920, Jul 31: Poppy Drives were held at Redfield, Aberdeen, Vermillion, Elk Point in South Dakota. 1920, Aug 05: Poppy Day in Richmond, California (north east of San Francisco). Madame Guérin fund-raised throughout the day and into the evening – she spoke at the Standard Oil Plant; local theatres and “other places”. A total of $760 was raised for Madame Guérin’s French war orphans. 1920, Aug 07: Poppy Drives at Yankton and Pierre in South Dakota. 1920, Aug 07: Poppy Day in Oakland, California – “when California’s native blooms will be sold to help French orphans. Mrs. William Thornton White has been appointed chairman of the day and will superintend the sale of the blossoms by several score by the younger girls. Madame Guerin is at the head of the committee raising funds for the erection of an orphanage for the fatherless children.” Hundreds of girls from all over the city volunteered – including on the city’s Alameda Island. Madame Guérin was there. 1920, Aug 11: Madame Guérin spoke at the New Santa Cruz theatre and the Casino ballroom, in the evening – in preparation of the Poppy Day there on Saturday the 14th. 1920, Aug 12: Madame Guérin was still in Santa Cruz. She spoke at the Native Sons Hall at 3 p.m. and from the beach bandstand at 4 p.m. She was “obliged to leave” Santa Cruz in the evening – it is deduced that she was probably heading to Los Angeles. 1920, Aug 14: Poppy Days in Santa Cruz; Capitola; East Santa Cruz; and Davenport in California. Miss Patsy A. Epperson, representing the American and French Children’s League had attended the “preliminaries” beforehand and Madame Guérin had followed during the week, ahead of the Poppy Days “to explain the aims and object of the league”. 1920, Aug 14: Poppy Day also occurred in Rapid City, South Dakota – as a result of Madame Guérin visiting in “earlier in the year”. 1920, Aug. 17: Madame Guérin gave two addresses in Long Beach (Los Angeles). She was establishing a branch of the America and French Children’s League and organising a Poppy Day in Los Angeles on 03 September. 1920, Aug. 18: Madame Guérin was presented to the Mayor of Long Beach (Los Angeles), in relation to her America and French Children’s League and Poppy Days. 1920, Aug. 19: Los Angeles, California: Madame Guérin was there establishing a branch of the America and French Children’s league and organising a “poppy day” sale there – thousands of dollars were realized. The poppies were made in France. 1920, Aug 21: Poppy Day in Arlington, South Dakota. 1920, Aug. 22: Long Beach, California: Madame Guérin was there … ?for a Poppy Drive. This is her ‘Inter-Allied Poppy Day’ scheme. The California American Legion told her to write to a Col. F.W. Galbraith who was to run for NAL national president. Madame Guérin knew Galbraith personally and he agreed that her poppy idea would be a fitting memorial. He told her he would make a reservation for her to speak on her subject at the National American Legion’s second convention in Cleveland, Ohio on 27-29 September. Thus, Madame Guérin attended in her own right and certainly not as a Y.W./Y.M.C.A. secretary – which has been widely reported. 1920, Sept 03: Poppy Day held in Los Angeles. Madame Guérin had devoted the day and the day before to a series of addresses before high school classes in the city, urging the girls to lend their aid after school. 1920, Sept 09: Madame Guérin arrived in Santa Ana, California in the afternoon – to outline her preliminary plans for Poppy Days in Santa Ana (11 Sept) and Orange, Anaheim and Fullerton on 18 September. She spoke that evening at the regular meeting of the Santa Ana Post of the American Legion. She also spoke in Orange and at a band concert in Anaheim. The Rotary Club of Santa Ana endorsed the project. 1920, Sept 11: Poppy Day campaign today in Santa Ana, California. 1920, Sept 14: Madame Guérin was in Des Moines, Iowa – to attend the Service Star Legion (14-17 September 1920) and address the women delegates about her American and French Children’s League and her Poppy Days. It is believed that she gave her address in a session at the Hotel Fort Des Moines on that day. It is deduced that, whilst there, Madame Guérin also extolled the virtues of the poppy as an emblem: in October 1919, the War Mothers/Service Star Legion adopted Madame Guérin’s idea – to adopt the poppy as its emblem but, at this convention, there was a rival proposition. A white carnation together with a red rose was adopted as its national flowers and the poppy rejected. 1920, Sept 14: Madame Guérin’s representatives Leonel O’Bryan & Helen Ahern addressed a Kiwanis meeting in Phoenix, about the Poppy Day in Phoenix on the 18th. 1920, Sept 18: Phoenix, Arizona: Poppy Day ran by 2 Red Cross representatives of the American & French Children’s League. These were Mrs. Leonel Ross O’Bryan of Denver, Colorado (“Polly Pry”) & Miss Helen Ahern, acting for Madame Guérin’s League. The “Day” made $1000. There were also Poppy Days in “other valley cities” in Arizona. In the evening a big charity Boxing Carnival was held in Phoenix – for the benefit of the American & French Children’s League. Glendale, Peoria & Mesa joined with Phoenix – Arizona Republican, Phoenix, 14 September 1920. O’Bryan was the director of the League’s regional headquarters, which was located in the Symes building, Denver. 1920, Sept 18: Poppy Day in (at least) Anaheim and Fullerton, Modesto, Orange, and Santa Ana of California. 1920, Sept.19: Madame Guérin attended the Encampment Convention of the ‘Grand Army of the Republic’ and the ‘Sons and Daughters of the G.A.R.’ (19-25 September 1920) in Indianapolis, Indiana. She asked for permission to use Decoration Day (30 May 1921) for her Annual Flanders’ Poppy Day. At the Encampment, the delegates endorsed Madame Guérin’s idea. 1920, Sept.24: The Great Army of the Republic’s “Allied organizations” concluded their national convention committees in Indianapolis, Indiana:- the Woman’s Relief Corps; the Sons of Veterans; the Sons of Veterans’ Auxiliary; the Daughters of Veterans; and the Ladies of the G.A.R. The Woman’s Relief Corps (at its closing session) agreed that $500 “be used for buying poppies made by the French women, the proceeds to go to the children’s relief organization”. The ‘Sons of Veterans’ (also known as ‘Sons of G.A.R. Veterans’) adopted the red poppy as its Memorial Flower, in its last business session at the Hotel Severin – it was reported that it had accepted the suggestion of the French President Millerand. The ‘Sons of Veterans’ was considered a “military order” in the U.S.A. and, as such, it was the FIRST “military order” to adopt the poppy as a Memorial Flower. 1920, Sept.25: Madame Guérin’s representatives Leonel O’Bryan & Helen Ahern were in charge of a “poppy tag day” in Tucson, Arizona – on behalf of the American & French Children’s League. 1920, Sept.27: Madame Guérin’s representatives Leonel O’Bryan & Helen Ahern left Tucson – heading for Bisbee, Arizona, to make arrangements for a Poppy Day there. 1920, Sept 27: On 27-29 September, the National American Legion held their second Convention in Cleveland, Ohio. Madame Guérin addressed the American Legion State Presidents about her “big idea” – ‘Inter-Allied Poppy Day’ scheme. So many American Legion State Commanders had already adopted Madame Guérin’s poppy emblem for their individual Posts; they either personally knew her and her fundraising work; or they knew of her. It must have been a foregone conclusion that the American League would adopt the poppy as their Memorial Flower at the convention. The idea was adopted – in the form of the ‘Shirley’ poppy. 1920, Oct. 01: Leonel O’Bryan left Bisbee – heading for Douglas, Arizona, to arrange a Poppy Day. Helen Ahern stayed behind to help with arrangements & assist with the “Day”. 1920, Oct. 06: Poppy Day in Bisbee, Arizona – paper poppies were distributed from 8 a.m. until 10 p.m! 1920, Oct.19: The War Mothers of Indiana began a 2-day State convention at Gas City and Jonesboro. Amongst the business discussed were plans to hold Poppy Days across the State on the next month’s Armistice Day – to benefit Madame Guérin’s American and French Children’s League. 1920, Nov. 10: Madame Guérin was in Louisville, Kentucky. With Leonel O’Bryan, she was at a meeting of the Women’s Club – in the interest of children in the devastated areas of France and asked them for assistance with a Poppy Day there. 1920, Nov. 11: Madame Guérin was still in Louisville. She spoke at the Louisville Girls’ High School – in the interest of children in the devastated areas of France and her suggestion for a Poppy Day. 1920, Nov. 11: Second Anniversary of Armistice Day. Poppy Days were carried out in the USA on and around that day, under the auspices of the Madame Guérin’s Children’s League. For example:- In New Castle, Pennsylvania, High School girls sold poppies. The girls were divided into teams – one captain and four other girls to each team. That Poppy Tag Day “netted the Legion $2,339. 1920, Nov. 13: Poppy Day in Akron, Ohio. Madame Guérin had visited Akron and Canton after the American Legion convention in Cleveland, Ohio. The Poppy Day in Canton raised $1,500 for Madame Guérin’s French orphans. 1920, Nov. 13: Poppy Day in Indianapolis (home of the American Legion HQ). The Indianapolis newspapers reported on how a Poppy Tag Day had been observed in that city on that day. Madame Guérin and Mrs. Isabella Mack assisted in the Indianapolis drive. “Several of the smaller cities in the state [of Indiana] will hold a Poppy Tag day November 13.” There were many Poppy Days in other places in the United States of America on that day. 1920, Nov. 13: Cincinnati (in Ohio) held a Poppy Day for the American and French Children’s League. 1920, Nov. 20: ‘Poppy Day’ in Louisville, Kentucky. Miss Helen Ahern and Leonel O’Bryan (“Polly Pry”) were there as Madame Guérin’s representatives. They had arrived on 13 November. 1920, Nov. 27: Poppy Day in Ellwood City, Pennsylvania. 1921, Mar 3: Madame Guérin was in Baltimore, My. She had “brought messages of gratitude for and felicitations on the work accomplished toward providing for the needs of these orphaned children” – the work being linked to Madame Guérin’s Children’s League and Poppy Days. 1921, 12 Apr: Madame Guérin addressed the first convention of the American Legion’s Women’s Auxiliary, in Columbus, Ohio. Her speech was entitled “A Message From France.” The Women’s Auxiliary had already taken the poppy as its Memorial Flower, like the men’s American Legion. 1921, Apr 28: Madame Guérin’s representative, Isabelle Mack, was in Wilkes Barre, Pennsylvania – to make preparations for the ‘Poppy Day’ there on 28 May – the date of the designated American and French Children’s League’s ‘Poppy Day’ across the U.S.A.
1921, May 5: Isabelle Mack, Secretary and representative of Madame Guérin‘s American and French Children’s League, was in Allegheny, Pennsylvania. She was the ‘organising secretary’ for the Poppy Days in the state of Pennsylvania – with headquarters in Philadelphia. 1921, May 6: Isabelle Mack was still in Allegheny, Pennsylvania, in the interest of the Poppy Days: in the morning, addressed the Allegheny High school; in the afternoon, Isabelle Mack spoke to the Junior Latimer High school and addressed a meeting of the Mothers of Democracy of Allegheny county, Pennsylvania. Isabella left Allegheny in the evening, for Erie. 1921, May 18: Madame Guérin’s sister Juliette Boulle arrived in Detroit, Michigan. The next day (19 May), Juliette met with American Legion officials to organise the poppy campaign in the city. 1921, May 20: The Bridgeport Telegram (Connecticut) printed this article: “Poppy Sale Starts. The American Legion poppy sale is on. 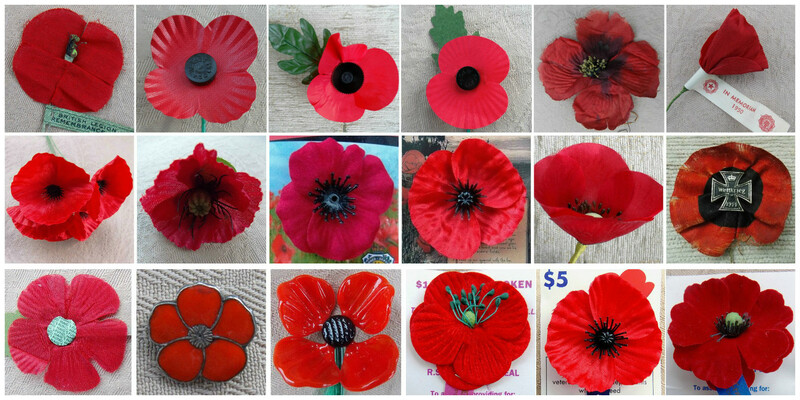 Poppies can be bought from any of the ex-service men at the cost of ten cents each. A large shipment was received from the Allingtown hospital, Allingtown, Conn. The disabled veterans made these flowers and the proceeds of the sale goes to them. 1921, May 28: Designated National ‘Poppy Day’ organised by the American-Franco Children’s League, within the USA and, reportedly, in France also (Denver Post). 1921, May 30: USA Memorial Day. Another Poppy Day conducted and, reportedly, poppies were placed on graves (Denver Post). Leading up to this day, the American Legion made appeals asking for everyone to wear a poppy on this day, as a “mark of respect and tribute to the brave soldiers of the World war”. 1921, 20 Jun: Madame Guérin addressed a meeting of the American Legion Delaware Post No.1 in Wilmington, Delaware. She thanked the State of Delaware for “selling far more than its share” of poppies on Memorial Day. 1921, July 04: Madame Anna Guérin spoke in Canada – to the Great War Veterans’ Association conference at the Prince Arthur Hotel, Port Arthur (now Thunder Bay) about adopting the poppy as its remembrance flower. American Legion National Commander Frederick W. Galbraith Jr. had given her a letter of recommendation to hand over. 1921, July 05: Madame Guérin’s proposal of an ‘Inter-Allied Poppy Day’ scheme was discussed by the G.W.V.A. 1921, July 06: The Canadian G.W.V.A. officially adopts the ‘Remembrance Poppy’ emblem. 1921, Jul 27: In Winnipeg, the Women’s service League held a Poppy Day. The League made several thousand poppies for weeks. Proceeds went to furnish new club rooms for ex-servicemen. 1921, Aug. 05: The Australian Returned Sailors and Soldiers’ Imperial League decided “… the red poppy, so conspicuous on the fields of France, should be adopted as an international emblem on armistice day …”, as part of Madame Anna Guérin’s proposal of an ‘Inter-Allied Poppy Day’ scheme. 1921, Aug. 06: After meeting up with Madame Guérin in Toronto, Colonel Samuel A. Moffat sailed from Vancouver, Canada … sent by Madame Guérin to promote her ‘Inter-Allied Poppy Day’ idea. He visited Australia and New Zealand (and probably South Africa, en route to Europe afterwards). 1921, Sept: In her 1941 Synopsis, Madame Guérin wrote about taking her ‘Inter-Allied Poppy Day’ idea to Italy and Belgium – perhaps she went on to these two countries during this month? 1921, Sept. 22: Madame Guérin’s friend, Madame Blanche Berneron, attended a meeting in the morning, at the Ritz Carlton Hotel, Montreal. The meeting was called by members of the Disabled Soldiers’ Employment Association and two lady co-presidents of L’Aide a la France. Arrangements for the Poppy Campaign in the Quebec province were discussed. In Quebec, the campaign was in the hands of the D.S.E.A. 1921, Sept. 26: The New Zealand Dominion Executive of Returned Services’ Association officially adopted the poppy at their conference, as part of Madame Guérin’s proposal of an ‘Inter-Allied Poppy Day’ scheme. 1921, 01 Oct: Madame Guérin LEFT LIVERPOOL FOR NEW YORK on the White Line ship ‘Celtic’. 1921, 10 Oct: Madame Guérin ARRIVED IN NEW YORK from Liverpool. She was going to join her sister at Kent Building, Toronto, Ontario – c/o Great War Veterans, Toronto. She promoted the ‘Inter-Allied Poppy Day’ and attend Remembrance commemorations. 1921, Oct. 19: Madame Guérin’s friend, Madame Blanche Berneron, arrived in Saskatoon, Saskatchewan to promote her poppies – she gave an interview to The Star[-Pheonix] newspaper in the morning. In Western Canada, Blanche was sometimes mistakenly referred to as the “Poppy Lady from France”. 1921, Oct. 20: Women from ‘The Princess Patricia’ Imperial Order Daughters of the Empire chapter in Winnipeg met in the evening to make poppies for Poppy Day – prior to a pending visit from Madame Guérin. 1921, Oct. 21: Madame Guérin’s friend, Madame Blanche Berneron, arrived in Edmonton, Alberta – to promote the Poppy Day campaign. 1921, Oct. 24: Madame Guérin was in Regina, Saskatchewan, Canada. She addressed the students of the Collegiate Institute and provincial Normal School “in furtherance of the sale of poppies” in the city on 11 November. In the evening, Madame Guérin left for Winnipeg (350mls away) – after giving an interview to the local newspaper ‘The Morning Leader’. Madame Guérin announced that she would award a silk French flag to the Regina school selling the largest number of poppies, in proportion to the number of students. It would be the Cornwall School that would win it, “with a percentage of 3.03 poppies sold by each pupil”. Friend Madame Blanche Berneron was still in Edmonton – she attended a meeting at Memorial Hall in the afternoon, to organise the Poppy Day and outline the campaign there. 1921, Oct. 25: A “Poppy Lady” was in Calgary – she was named as “Madame Blanche Berneron” (Madame Guérin’s friend), although it had been reported that it was Madame Guérin’s sister who would arrive. In the afternoon, she attended “a meeting of all the various women’s organizations” in that city to “discuss and arrange for the details of the “Poppy Day” campaign”. The Great War Women’s Association handled the campaign in Calgary. It was announced that: Vancouver had sold out of its first 36,000 poppies and the city was requesting more; Edmonton had been left 36,000; and Calgary had 36,000, which would be sold on Armistice Day. Madame Guérin arrived in Winnipeg, Canada – to promote her ‘Inter-Allied Poppy Day’. 1921, Oct. 26: In Winnipeg, Madame Guérin was a luncheon guest of the Imperial Order Daughters of the Empire & Great War Veteran’s Association’s women’s auxiliary at the Fort Garry Hotel – these women would spear-head Madame Guérin’s ‘Inter-Allied Poppy Day’ in Winnipeg. Madame Guérin left Winnipeg during the evening to go to Kansas City, Missouri – to attend the American Legion convention. She had been officially invited to attend – to meet with French Marshal Ferdinand J. M. Foch, British Admiral David R. Beatty and Italian General Armando Diaz – but she was also going to fight for the poppy emblem, over the Legion’s intention to adopt the daisy instead. It was announced that: Vancouver had sold out of its first 36,000 poppies and the city was requesting more; Edmonton had been left 36,000; and Calgary had 36,000, which would be sold on Armistice Day. 1921, Nov 01: The Poppy Day campaign in Ottawa began. It ended in the afternoon of 7 November. $7,000 was the approximate result, forty per cent of which will go to the relief committee of the G.W.V.A. 1921, Nov. 06: Madame Guérin’s friend, Madame Blanche Berneron, was in Victoria, British Columbia – to promote Poppy Day. She spoke at the Capitol Theatre that evening and was staying at the Strathcona Hotel for a week. 1921, Nov. 07: Madame Guérin was in Ottawa – it was Canada’s Thanksgiving Day but it had also been designated Remembrance Day. It was reported that Madame Guérin marched with the Great War Veterans’s Association’s veterans and laid a wreath of poppies at the commemorative pylon (temporary War Memorial) on Parliament Hill. She was one of the VIP guests on the VIP platform and within the V.E.P. enclosure at the Memorial Service (accompanying Their Excellencies Lord and Lady Byng). Madame Blanche Berneron attended a Kumtuks Club luncheon in Victoria, BC – to promote the Poppy Day campaign. 1921, Nov. 08: Moїna Michael wrote to The American Legion, concerning the adoption of the daisy and the poppy repudiation. Adjutant Lemuel Bolles replied on 23 November, quoting the recommendation which was adopted at the Conference … to the detriment of the poppy. 1921, Nov. 11: Third anniversary of Armistice Day. Veteran organisations of Canada; Australia; Newfoundland; and Great Britain carried out their first Poppy Day campaigns, run by their respective WW1 veterans’ organisations. It was reported that France participated also. In Great Britain, Madame Guérin’s poppies were not distributed during any year other than 1921. Madame Guérin wrote about taking her ‘Inter-Allied Poppy Day‘ idea to Belgium and Italy so they may have participated on this date. No evidence has been found relating to the date of the first Poppy Day in South Africa but it may have been this date, if Colonel Moffat carried Madame Guérin’s message en route from Australia/New Zealand. Madame Guérin’s friend, Madame Blanche Berneron, “represented France” at an ‘Armistice Cabaret’ at the Old Drill Hall in Victoria, British Columbia. 1921, Nov. 25: St. Thomas’ Mayor Brinkman presented a French flag to the local branch of the G. W. V. A. – “As a reward for selling so many red poppies on Armistice Day”. He did so “on behalf of Mademoiselle Yette Boulle”(Madame Guérin’s sister Juliette). 1921, Dec. 06: Madame Guérin’s sister, Mlle. Juliette Boulle, and friend, Madame Blanche Berneron set sail on the Canadian Pacific ship ‘Sicilian’ from St. John, New Brunswick – to take poppies to Cuba and establish a Poppy Committee. It was planned that Cuba had its Poppy campaign over the Christmas period. 1922, Feb: The American Legion conducted a state wide “daisy drive”. 1922, Mar.03: Women in Wellington, New Zealand, held a “Diggers’ Poppy Day” to benefit the Returned Soldiers’ Association. A committee is to be set up to make the poppies. The event took the shape of stalls situated along several streets, which sold various items. The whole event raised £505 16s 9d “exclusive of donations”. 1922, Apr.24: The first New Zealand Poppy Day – on the eve of Anzac Day. The New Zealand Returned Soldiers’ Association veterans and women’s groups carried out New Zealand’s first Poppy campaign leading up to Anzac Day e.g. Christchurch held their Poppy Days on the 19 and 21 of April. Madame Guérin’s French-made poppies were distributed. 1922, May 11: On this day, Madame Guérin’s friend Madame Blanche Berneron spoke to the state convention of the VFW – making a plea that “the Inter-Allied Poppy Day be established for years to come …” Additionally, Mrs. Leonel R. C. A. O’Bryan (of Denver), who had been Madame Guérin’s A.F.C.L. National Organizer, was described as Regional Director/Organizer of the VFW during the 1922 Poppy Drive. 1922, May 22: Poppy Week was May 22-30 inclusive, run by the ‘Veteran’s of Foreign Wars’. The ‘American War Mothers’ also helped run this campaign and contributed to the success of it. Madame Guérin’s French-made poppies were distributed. This was the first Poppy campaign run by US veterans (Veterans of Foreign Wars) in the USA. It had been Madame Guérin’s American-Franco Children’s League that had run the very first poppy campaign ever – in the USA in 1921. As aforementioned, the Milwaukee American Legion Post 1 carried out the first American Legion run Poppy Day on 29 May 1920. Worldwide, this 1922 US campaign was the fifth Poppy campaign run by Allied veterans. It is believed that the monies raised from this Poppy Week went entirely to the widows and orphans of devastated France. 1922, May 28: This day (a Sunday) was designated ‘National Poppy Day’, in the USA. 1922, May 30: USA Memorial Day, last day of the ‘Poppy Week’. Madame Guérin’s French-made poppies were distributed. 1922, Jun 16/17: The ‘American Legion’ conducted a state wide “daisy drive”. It would seem that the ‘American Legion’ distanced itself from the recent VFW Poppy Drive: the 17 June 1922 edition of the Cambridge Chronicle (Massachusetts) carried an article headed “LEGION DAISY DRIVE” whereby the American Legion Commander J. D. Crowley stated “In view of the apparent misunderstanding relative to the recent “poppy drive,” I wish to call the attention of the public to the fact that this “poppy drive has no connection whatsoever with the American Legion. It is true that it has been the custom of the American Legion to have a “poppy drive” just before Memorial day, but at the last national convention the American Legion adopted the daisy as its flower in place of the poppy.” and he trusted that, from 16-22 June inclusive, “everyone will wear a daisy, symbolizing co-operation with the American Legion, the greatest organization of war veterans in existence today …”. The reality was the American Legion rued their decision when the VFW; ‘American War Mothers’; American-Franco Chldren’s League1922 Poppy campaign was just as successful as the year before. 1922, Aug: The ‘Veterans of Foreign Wars’ adopted the poppy as its official Memorial flower at a National Encampment held in Seattle, Washington. 1922, Oct: At its convention in October 1922, the ‘American Legion’ “repudiated the daisy as its official flower and again adopted the poppy”. Even before that decision was made, American Legion Posts were holding poppy days across the country. 1922, Nov. 11: Fourth anniversary of Armistice Day. In Australia, Madame Guérin’s poppies were used. In Canada, some of Madame Guérin’s poppies were used – her poppies were not used in Canada after this year. 1922, Dec 3: Madame Guérin left New York, to return to France – to implement the orders for poppies from the Veterans of Foreign Wars and American Legion. 1923, Apr.23: New Zealand’s Poppy Day ahead of Anzac Day on 25th. Madame Guérin’s French-made poppies were distributed. 1923, May: The ‘American Legion’ conducted its first nationwide sale of poppies (French-made). 1923, Nov. 11: Fifth anniversary of Armistice Day. In Australia, Madame Guérin’s poppies were used. 1924, Feb: The ‘Veterans of Foreign Wars’ registered the design of the ‘Buddy’ poppy with the US Patent Office. 1924, Apr.23: New Zealand’s Poppy Day ahead of Anzac Day on 25th. Madame Guérin’s French-made poppies were distributed. 1924, May: Since this date, the Veterans of Foreign Wars organisation has conducted annual sales of the ‘Buddy’ poppy (American-made) in the USA. * (*‘Mountain Democrat’: Placerville, California). Today, the US ‘Buddy’ poppy is not seen or worn on the same scale as the poppies worn in Commonwealth countries. The VFW always mentions Madame Guérin when it refers to the history of the Poppy emblem. 1924, Nov. 11: Sixth anniversary of Armistice Day. In Australia, Madame Guérin’s poppies were distributed. 1925, Apr.22: New Zealand’s Poppy Day ahead of Anzac Day on 25th. Madame Guérin’s French-made poppies were distributed. 1925, Nov. 11: Seventh anniversary of Armistice Day. In Australia, Madame Guérin’s poppies were distributed. 1926, Apr.23: New Zealand’s Poppy Day ahead of Anzac Day on 25th. Madame Guérin’s French-made poppies were distributed. 1926, Nov. 11: Eighth anniversary of Armistice Day. In Australia, Madame Guérin’s poppies were distributed – her poppies were not used in Australia after this year. 1927, Apr.22: New Zealand’s Poppy Day ahead of Anzac Day on 25th. Madame Guérin’s French-made poppies were distributed. 1928, Apr.22: New Zealand’s Poppy Day ahead of Anzac Day on 25th. Madame Guérin’s French-made poppies were distributed – her poppies were not used in New Zealand after this year. A Plethora of Remembrance Poppies. Courtesy of Heather Anne Johnson.